Protein catabolism in acute renal failure (ARF): contributing factors. The causes of hypercatabolism in ARF are complex and multifold and present a combination of nonspecific mechanisms induced by the acute disease process and underlying illness and associated complications, specific effects induced by the acute loss of renal function, and, finally, the type and intensity of renal replacement therapy. 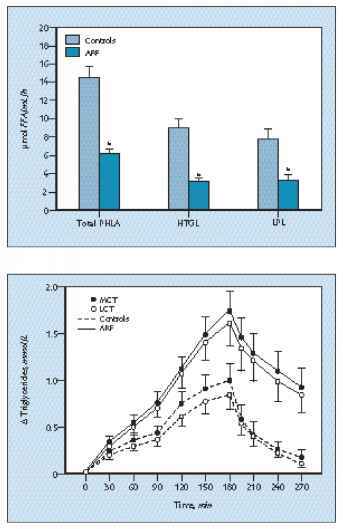 A major stimulus of muscle protein catabolism in ARF is insulin resistance. In muscle, the maximal rate of insulin-stimulated protein synthesis is depressed by ARF and protein degradation is increased even in the presence of insulin . Acidosis was identified as an important factor in muscle protein breakdown. Metabolic acidosis activates the catabolism of protein and oxidation of amino acids independently of azotemia, and nitrogen balance can be improved by correcting the metabolic acidosis . These findings were not uniformly confirmed for ARF in animal experiments . Several additional catabolic factors are operative in ARF. The secretion of catabolic hormones (catecholamines, glucagon, glucocorticoids), hyperparathyroidism which is also present in ARF (see Fig. 18-22), suppression of or decreased sensitivity to growth factors, the release of proteases from activated leukocytes—all can stimulate protein breakdown. Moreover, the release of inflammatory mediators such as tumor necrosis factor and interleukins have been shown to mediate hypercatabolism in acute disease [1, 2]. The type and frequency of renal replacement therapy can also affect protein balance. Aggravation of protein catabolism, certainly, is mediated in part by the loss of nutritional substrates, but some findings suggest that, in addition, both activation of protein breakdown and inhibition of muscular protein synthesis are induced by hemodialysis . Last (but not least), of major relevance for the clinical situation is the fact that inadequate nutrition contributes to the loss of lean body mass in ARF. In experimental animals, starvation potentiates the catabolic response of ARF . Amino acid pools and amino acid utilization in acute renal failure (ARF). As a consequence of these metabolic alterations, imbalances in amino acid pools in plasma and in the intracellular compartment occur in ARF. A typical plasma amino acid pattern is seen . Plasma concentrations of cysteine (CYS), taurine (TAU), methionine (MET), and phenylalanine (PHE) are elevated, whereas plasma levels of valine (VAL) and leucine (LEU) are decreased. 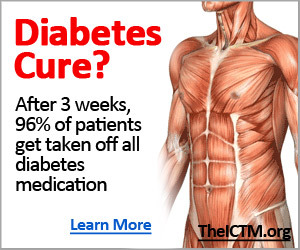 sized or converted by the kidneys and released into the circulation: cysteine, methionine (from homocysteine), tyrosine, arginine, and serine . Thus, loss of renal function can contribute to the altered amino acid pools in ARF and to the fact that several amino acids, such as arginine or tyrosine, which conventionally are termed nonessential, might become conditionally indispensable in ARF (see Fig. 18-11) . 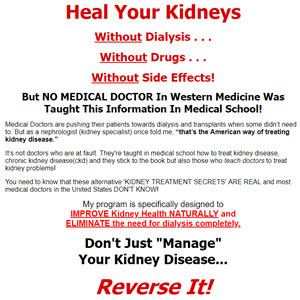 In addition, the kidney is an important organ of protein degradation. Multiple peptides are filtered and catabolized at the tubular brush border, with the constituent amino acids being reabsorbed and recycled into the metabolic pool. In renal failure, catabolism of peptides such as peptide hormones is retarded. This is also true for acute uremia: insulin requirements decrease in diabetic patients who develop of ARF . patients: histidine, arginine, tyrosine, serine, cysteine . Infusion of arginine-free amino acid solutions can cause life-threatening complications such as hyperammonemia, coma, and acidosis. 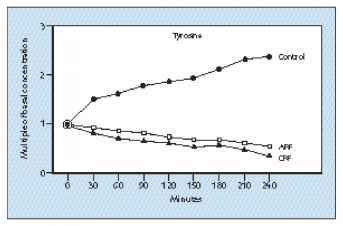 Healthy subjects readily form tyrosine from phenylalanine in the liver: During infusion of amino acid solutions containing phenylalanine, plasma tyrosine concentration rises (circles) . 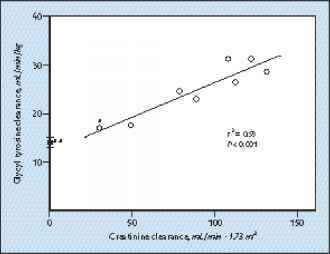 In contrast, in patients with ARF (triangles) and chronic renal failure (CRF, squares) phenylalanine infusion does not increase plasma tyrosine, indicating inadequate interconversion. Recently, it was suggested that glutamine, an amino acid that traditionally was designated non-essential exerts important metabolic functions in regulating nitrogen metabolism, supporting immune functions, and preserving the gastrointestinal barrier. 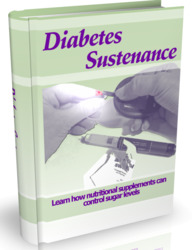 Thus, it can become conditionally indispensable in catabolic illness . Because free glutamine is not stable in aqueous solutions, dipeptides containing glutamine are used as a glutamine source in parenteral nutrition. The utilization of dipeptides in part depends on intact renal function, and renal failure can impair hydrolysis (see Fig. 18-10) . No systematic studies have been published on the use of glutamine in patients with ARF, and it must be noted that glutamine supplementation increases nitrogen intake considerably. Estimation of protein catabolism and nitrogen balance. The extent of protein catabolism can be assessed by calculating the urea nitrogen appearance rate (UNA), because virtually all nitrogen arising from amino acids liberated during protein degradation is converted to urea. Besides urea in urine (UUN), nitrogen losses in other body fluids (eg, gastrointestinal, choledochal) must be added to any change in the urea pool. When the UNA rate is multiplied by 6.25, it can be converted to protein equivalents. With known nitrogen intake from the parenteral or enteral nutrition, nitrogen balance can be estimated from the UNA calculation. In nonhypercatabolic patients, during the polyuric phase of ARF protein intake of 0.97 g/kg body weight per day was required to achieve a positive nitrogen balance . A similar number (1.03g/kg body weight per day) was derived from a study in which, unfortunately, energy intake was not kept constant . In the polyuric recovery phase in patients with sepsis-induced ARF, a nitrogen intake of 15 g/day (averaging an amino acid intake of 1.3 g/kg body weight per day) as compared to 4.4 g/kg per day (about 0.3 g/kg amino acids) was superior in ameliorating nitrogen balance . Several recent studies have tried to evaluate protein and amino acid requirements of critically ill patients with ARF. 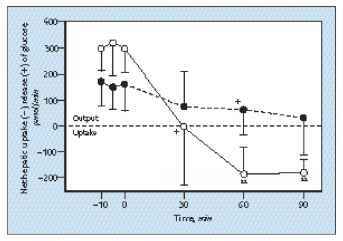 Kierdorf and associates found that, in these hypercatabolic patients receiving continuous hemofiltration therapy, the provision of amino acids 1.5 g /kg body weight per day was more effective in reducing nitrogen loss than infusion of 0.7 g (-3.4 versus -8.1 g nitrogen per day) . An increase of amino acid intake to 1. 74 g/kg per day did not further ameliorate nitrogen balance. Glucose metabolism in acute renal failure (ARF): Stimulation of hepatic gluconeogenesis. A second feature of glucose metabolism (and at the same time the dominating mechanism of accelerated protein breakdown) in ARF is accelerated hepatic gluconeogenesis, mainly from conversion of amino acids released during protein catabolism. Hepatic extraction of amino acids, their conversion to glucose, and urea production are all increased in ARF (see Fig. 18-7) . In healthy subjects, but also in patients with chronic renal failure, hepatic gluconeogenesis from amino acids is readily and completely suppressed by exogenous glucose infusion. In contrast, in ARF hepatic glucose formation can only be decreased, but not halted, by substrate supply. As can be seen from this experimental study, even during glucose infusion there is persistent gluconeogenesis from amino acids in acutely uremic dogs (•) as compared with controls dogs (o) whose livers switch from glucose release to glucose uptake . Lipid metabolism in acute renal failure (ARF). Profound alterations of lipid metabolism occur in patients with ARF. The triglyceride content of plasma lipoproteins, especially very low-density (VLDL) and low-density ones (LDL) is increased, while total cholesterol and in particular high-density lipoprotein (HDL) cholesterol are decreased [33,34]. The major cause of lipid abnormalities in ARF is impairment of lipolysis. The activities of both lipolytic systems, peripheral lipoprotein lipase and hepatic triglyceride lipase are decreased in patients with ARF to less than 50% of normal .